Specially Designed Emergency Rescue / Survival Blanket Provides Compact Secure Protection In All Weather Conditions. 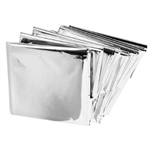 Made of a Rugged Durable Insulated Mylar Material. Consistently Retains and Reflects 90% of Body Heat. Folded to Compact Size For Easy Storage. Rescue Blanket provides compact emergency protection in all weather condition. Made of insulated mylar material.